This shows the inside of my workshop on a typical working day. 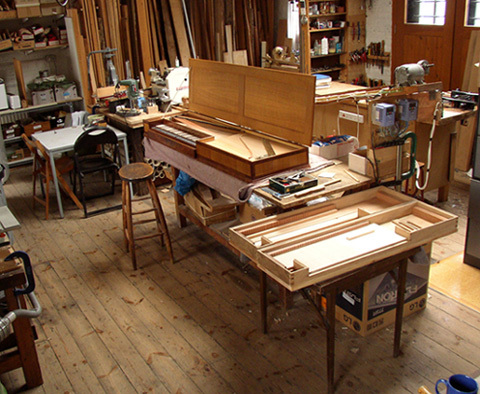 A large unfretted clavichord, undergoing refurbishment, occupies centre stage; two smaller clavichords, in course of construction, are parked nearby. The motor of the home-made string-winding machine, on which over-wound strings are made, can be seen. In the background are a lathe, benches with planes (parked on their sides to avoid spoiling the cutting edge), tool racks, a small part of my wood stack – and the café table where we take our lunch! [To return to text file, click here].